Google’s new OnHub, or Apple’s tried-and-true AirPort Extreme? Many will face a choice when shopping for a new router, but choosing between these two isn’t as cut-and-dry as it might seem. Both pack a punch, but the intangibles set them apart. 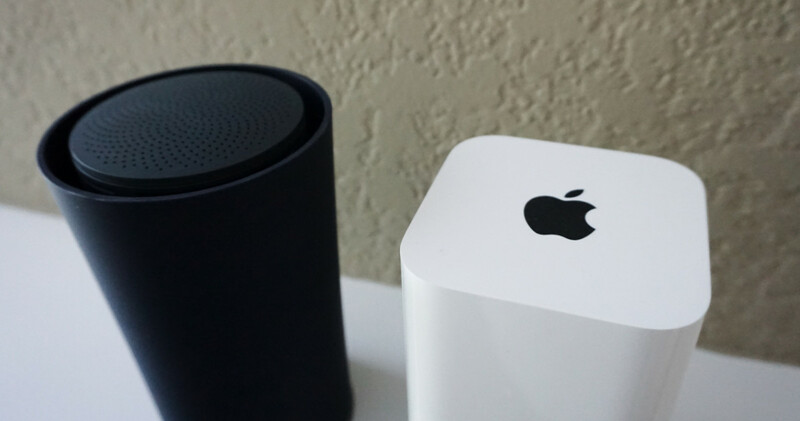 Here is the Google OnHub vs Apple AirPort Extreme review. OnHub is plastic-y, and light. AirPort Extreme is also plastic, but feels a bit sturdier and dense. As aesthetics go, it comes down to color and shape; do you want a dark blue cylinder, or a squared white tower? Around back, AirPort Extreme has more ports than OnHub. Google’s new router basically wants to connect you to the internet and let you roam free. The AirPort Extreme lets users connect more peripherals, like hard drives or printers. The ability to access a central storage solution on the network is something many may find handy. Both offer 802.11ac Wi-Fi, with the AirPort Extreme having six antennae (three for 2.4GHz, and three for 5GHz). OnHub has 13 antennae; double what AirPort offers, and one “congestion-sensing” antenna. I gotta say — I was a bit surprised here. The two routers are pretty much dead even when it comes to performance on my network. I actually saw no discernible issues or laudable spikes from either. Both offer a stellar signal throughout my home, even when I put more space (and walls) between hardware. The signal strength also translates to mobile devices; dead even, across the board. As signal strength goes, Google and Apple are on the same path. Google doubling down on antennas doesn’t seem to matter here, nor does the circular arrangement of them. So far, I’d give the edge to Apple. AirPort’s additional ports and denser build give it a leg-up, and the performance is very even between the two. The software edge goes to Google, though. 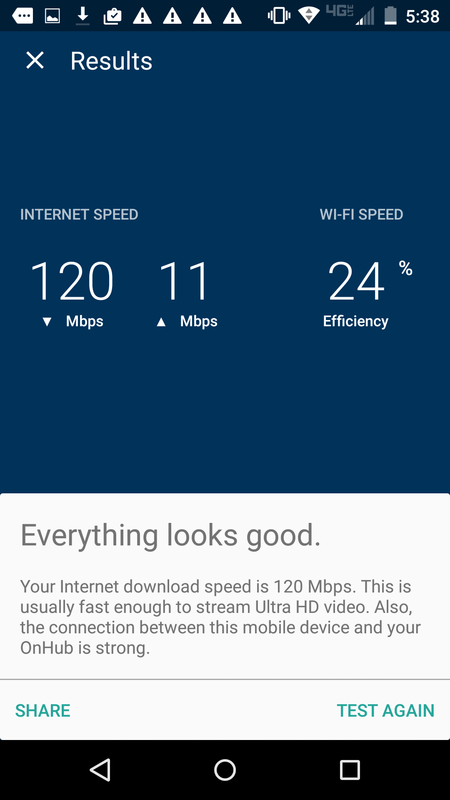 While OnHub doesn’t offer a desktop app (yet, at least), its Google On mobile app is damn good. It offers a dead-simple set-up process, which is great for those who may be intimidated by setting up a router. 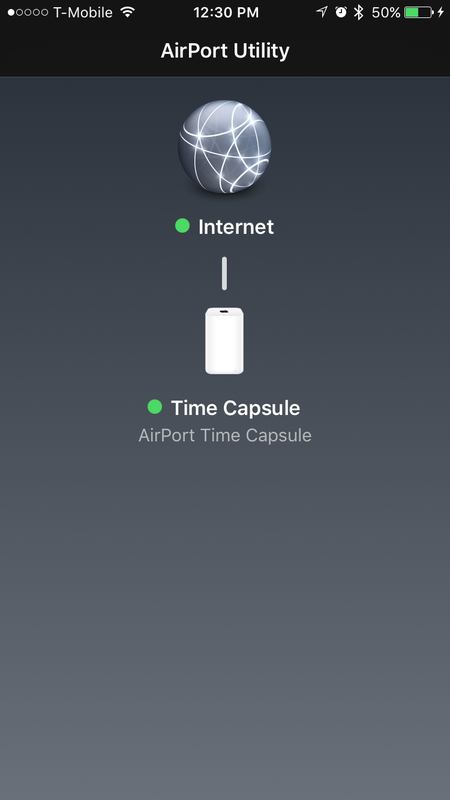 Apple’s AirPort Utility for mobile is also helpful once you plug your AirPort Extreme in, but it’s just not as polished as OnHub. It’ll walk you through the basic steps for setting up Apple’s router, but little else. Apple offers a solid view of your network’s information like the IP address and connection status, but the software is very Mac-centric. If you don’t have a Mac, you won’t get to see all the info AirPort can offer. I also like Google’s performance insights. It can run a network test for you, which match Speedtest pretty accurately. 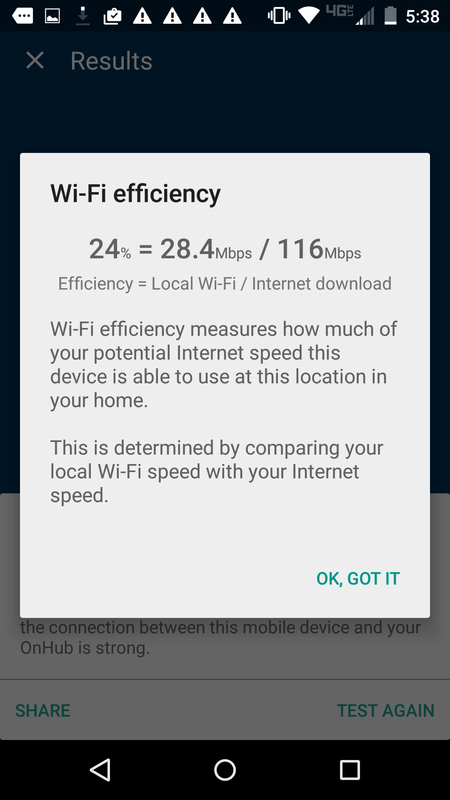 It piles on by giving you an efficiency score, which lets you know if your devices are taking full advantage of the data transfer speeds. While a desktop app is nice to have, it’s unnecessary for many consumers. All told, the Google On app offers what AirPort Utility does — and more. It’s also available for iOS or Android. The answer here isn’t surprising. Apple’s hardware is meant for Apple households; if you’re a Mac owner with an iPhone (and/or iPad), the Apple AirPort Extreme is your best bet. I find the AirPort Utility app for Mac better than the fairly static view its mobile app offers, as that’s where Apple tucks all the functionality. If I want to set up an AirPort extreme to increase signal strength, doing it on the desktop is almost a requirement. I like the ability to attach a hard drive to my AirPort Extreme, and the Time Capsule models offer internal storage for backing devices up. 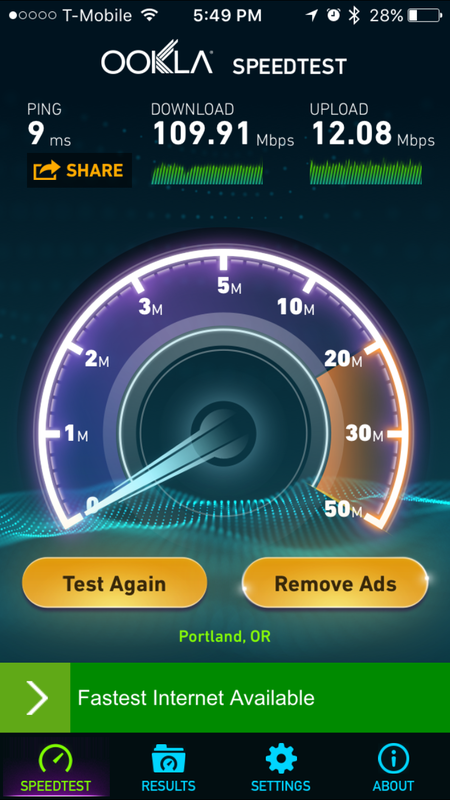 As someone with a Mac, the AirPort Extreme is easily my winner. OnHub offers the same data transfer speeds as AirPort Extreme, and when you step outside of Apple’s universe — it’s a toss-up between the two. If you’ve got an Android device, you’ll probably want OnHub, specifically for the app. It really is that user friendly. Those with an iPhone and a Windows computer should probably consider OnHub, too. OnHub doesn’t encourage me to ditch my AirPort Time Capsule. At all. If I weren’t a Mac user, I’d be remiss not to take a hard look at OnHub. Performance is equally impressive between the two. Apple made the AirPort Extreme router for Apple users, and that’s just fine. I prefer the plethora of ports, because I like having a few hard drives hooked up. If I were a different kind of user, though, OnHub would probably be my choice, here. You can buy Apple’s AirPort Extreme at an Apple Store, Best Buy or via Amazon. Google’s OnHub is available directly from Google, or via Best Buy. Both retail for $199.99.